If you are a fashionista, like myself, you most likely heard of ikat. It has been on many runways in the past decade; Oscar De La Renta included atlas in his Fall 2005 collection suddenly bringing Uzbek textiles into high-end Western fashion. Since then houses including Balenciaga, Dior and Valentino have used ikats and other silk fabrics from Uzbekistan. It can be seen on everything from dresses to bed sheets, but despite its recent surge in popularity, this is not a new trend. 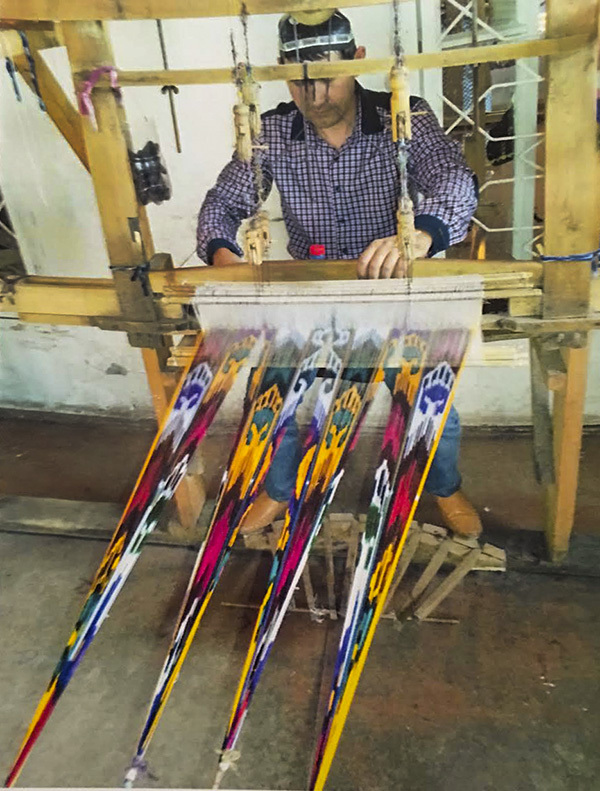 Ikat is centuries old, and has a lot more behind it than one may think. Did you know that most ikat textiles found in stores in the U.S. are fake? That’s right……. 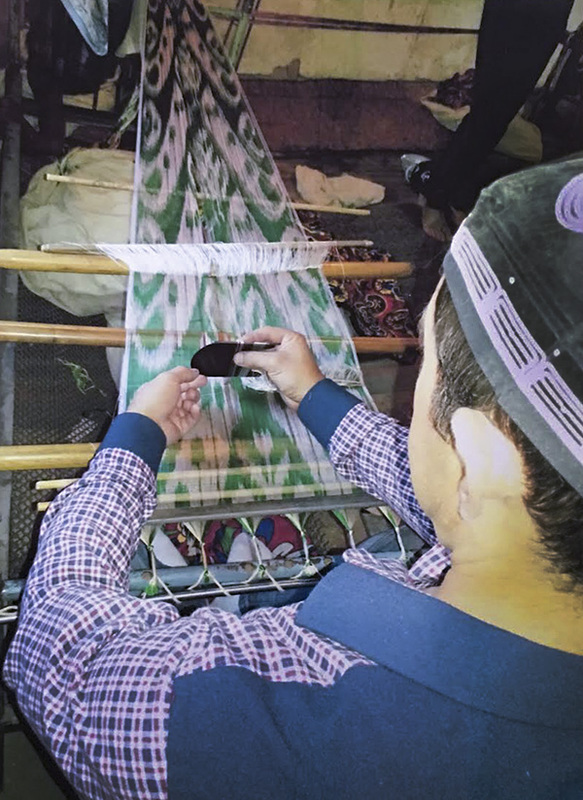 In order to be a true ikat textile, the creation process has to follow the proper guidelines. We’ll fill you in on what makes a real ikat fabric. 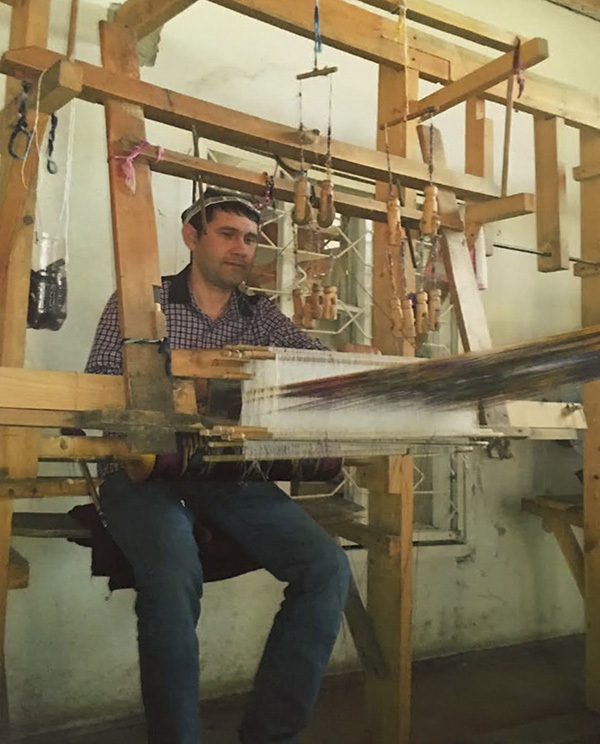 To get a better understanding and dive into the centuries old traditions, I spoke to a real pro of this business, a true descendant of a professional fabric weavers clan- Rustam Valiev. He is a very popular figure in his native Uzbekistan and his name has been mentioned in various media outlets and books on national crafts. G.A. : Rustam, could you please clarify for our readers what exactly does ikat mean and it’s origin? R.V: I will be more than happy to, Gunel. Ikat-weaving technique emerged in different parts of the world, often independently. India and Indonesia have their own long traditions of ikat making, however, it is ikat fabrics from Uzbekistan which have become a late hit in fashion and interior design industries for their large and bold patterns, and for mixing unimaginable ikat colors you would originally think would not work together. Ikat fabrics are often used as a chic upholstery fabric, curtains, pillow covers, throws and quilts. Ikat from Uzbekistan, defined as abrabandi, meaning “bound cloud”, which is the most captivating, using a resist dye process whereby the warp yarns (vertical threads) are bound and dyed by hand before being woven with the weft yarns (horizontal threads). It is a very ancient way of creating designs in fabric by resist-dyeing the threads before the fabric is woven. Ikats are also used for household use, especially in the most formal parts of the house where guests are welcomed. Uzbekistan silk fabrics have their own names: shoi, khan-atlas, atlas, podshokhi. These types of fabrics are produced from pure silk. The fabrics made of cotton weft and silk warp are called adras, bekasab, pasma, banoras. Patterns are named after shapes they resemble. Traditionally, the most wide-spread ornaments “tumorcha” – amulet, “tarok” – comb, “gadjak” – jewelry, “bodom” – almond, “darakht” – tree, “anor” – pomegranate, “Oy” – the Moon, “shokh” – horn, “chirog” – lampad, “ilon izi” – snake trail, “kapalak” – butterfly, “chayon” – scorpion, and etc. Due to the special properties, these versatile fabrics keeps cool in the summer and heat in the winter. G.A. 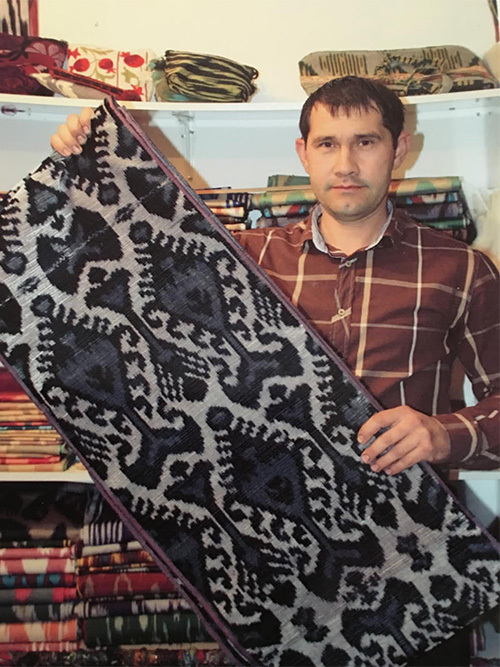 : You belong to a renowned dynasty of textile weavers- your uncle Nurmuhammad Valiev is one of the most famous textile weavers in Uzbekistan and possesses numerous honors and diplomas. R.V. : I am a sixth generation professional textile weaver. Growing up in a very creative environment, I showed interest in helping my father and uncle in the process of fabric creation. I worked as a master’s assistant for years, as it takes a long time to master this craft. The tradition of making fabrics originated in Uzbekistan since ancient times, and we are really particular in preserving the tradition. I am very proud of my heritage! G.A. It seems that historically the textile production in Uzbekistan had its ups and downs. Let’s talk about how the Soviet regime affected the textile production and what it took to revive the almost forgotten tradition. R.V. : Between the early nineteenth century and the beginning of the Soviet period, there was an extraordinary flowering of the art of textile weaving in Central Asia. With the Soviet revolution, the new Soviet government set about standardizing Uzbek culture to fit its new Soviet ideals. The natural dyes were changed to chemical dyes and the ikat patterns were standardized. A few patterns were produced every year with set colors, woven in silk, the cocoons raised on cooperative farms. In 1991, independence came and there were new questions and new opportunities. Some master craftsmen who had kept their ancestral skills alive by working secretly during the Soviet years! Everything was slowly returning to traditional production. With some foreign aid and government help, all production has now returned to traditional workshops, with hand binding, dyeing, and weaving. G.A. : I heard there are some legends surrounding origins of textile producing tradition in Uzbekistan. R.V. : Indeed! I heard this story from my father, and he heard it from his….. One legend states that once an artist sat by a fast running stream. The stream reflected the clouds, and changed their form. Suddenly sunrays were fractured and became a rainbow, which was reflected in the stream. The artist saw a picture of clouds playing with colors. He painted that picture and showed it to weavers who then transferred his picture to fabrics. Later the word abr (which means cloud) was used as the name of the process of dyeing base threads in traditional fabrics, so fabrics were named abr-fabrics and weavers were called abrbands. G.A. : Is it still popular for women in your country to wear traditional patters? R.V. : Modern fabrics also are made in shape of traditional Uzbek jewelry including drop-earrings and triangular-shaped pendants (tumor). When a young Uzbek woman got married, she was expected to wear jewelry, which represented the wealth of her family. It was said that if a woman could not walk due to the heaviness of her new jewelry, she came from a wealthy family. However, jewelry was expensive, and a wedding ceremony without jewelry was considered shameful, so to solve this problem, people began to buy textiles with patterns representing jewelry. Women still wear clothes to show their “Uzbekness” and heritage. Today you’ll see the same proud tradition of wearing ikat as a symbol of status and cultural pride amongst men and women in Uzbekistan. 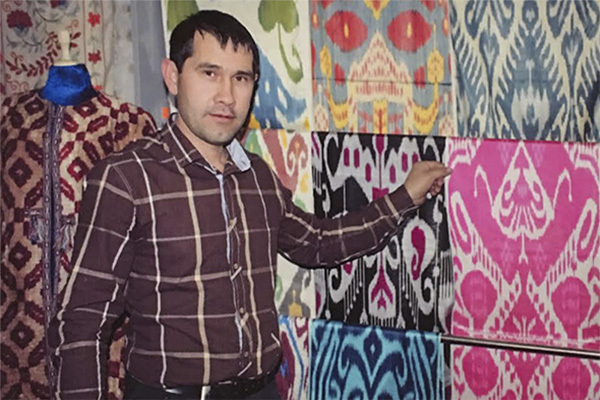 Meanwhile Uzbekistan continues to change as it finds its place in the modern era, but one thing is certain– ikats will continue to play a huge part in Uzbek life and culture. And they make a great outfit too!